Fauvel's Rondeaux is the general title of a new CD of chamber music for clarinet, strings and piano. It contains four works, ranging across McCabe's entire career as a composer. Movements, for clarinet, violin and cello, dates from 1964 and was revised in 1966. The Sonata for Clarinet, Cello and Piano was written in 1969, and was inspired by Stanley Kubrick's iconic film 2001; A Space Odyssey. Fauvel's Rondeaux (1995/6) is to some extent a satellite work of McCabe's ballet, Edward II - though some of the material predates this - and is written for clarinet, violin and piano. It takes its idea from the medieval Roman de Fauvel, in which a donkey becomes Lord of the World, a kind of King of Misrule, as a form of political and religious satire on corruption. The final item is the Clarinet Quintet La Donna (2010/11), which was commissioned by and specially written for Linda Merrick and the Kreutzer Quartet. The performers on the CD are Linda Merrick (clarinet), the Kreutzer Quartet (Peter Sheppard Skaerved,violin; Mihailo Trandafilovski,violin; Morgan Goff, viola; Neil Heyde, cello) and Aaron Shorr, piano, and the CD is released by Guild, on GMCD 7369. "Spanning 45 years, these pieces illustrate the composer's constantly refreshed approach to writing for chamber forces whilst at the same time displaying a remarkable consistency of quality and imagination ... Movements wears its techniques very lightly indeed and makes a highly effective and engaging open­ing item. "... Fauvel's Rondeaux ... is a disconcerting piece of symphonic breadth and ambition which probes dance music's sinister and baser aspects... the darkly sinister nature of the score emphasized by the use of a version for clarinet doubling bass clarinet. "Frequently pastoral in tone, the Clarinet Quintet is one of McCabe's most joyous and relaxed pieces... All four performances on this Guild disc are of a high standard, but perhaps the performers' extra familiarity with the Clarinet Quintet pays extra dividends as this work receives a particularly fluent and commanding reading of impressive authority. Superbly recorded, this valu­able addition to the McCabe discography is well worth acquiring." "It's always a pleasure to listen to John McCabe's music. Its elegant craftsmanship and expressional invitation unfailingly take hold, bidding that we listen and become involved. "So it is with Movements, seven of them playing continuously and scored for clarinet, violin and cello. Each section is brief and each opens the ears and cues the imagination. McCabe (born in 1939 in the Huyton area of Liverpool) composed Movements in 1964 as a 'reaction' to William Faulkner's novel The Sound and the Fury. The very engaging music seems somewhat experimental (maybe), even displaying a dalliance with the then avant-garde, and formally is set as a palindrome. "From five years later, the Sonata for clarinet, cello and piano is a single, 13-minute movement of varied moods, predominantly dark and isolated, with fast sections angular and discursive. The pianist is sometimes required to play inside the piano, creating a surreal effect. McCabe informs us of another extra-musical connection: 'the sense of space and loneliness conveyed by sections of Stanley Kubrick's film 2001: A Space Odyssey ...'. "The other two works, both lasting for nearly 20 minutes, are more recent creations. 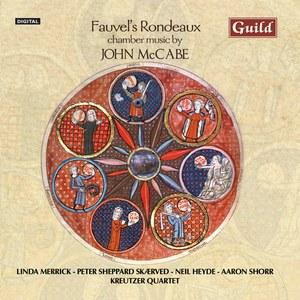 Fauvel's Rondeaux (completed in 1996) is for clarinet/bass clarinet, violin and piano. The inspiration is from the Medieval Roman de Fauvel: a donkey (Fauvel) becomes Lord of the World. Opening in sustained energetic and aggressive style, this 'gigantic rondo' of a piece is allusive to 'court entertainment and the gradually darkening world of conspiracy, lust and power-mania ...'. It's a powerful and compelling piece, a 'satellite work' to McCabe's earlier score for the ballet Edward II, and is quite disturbing at times. "From just last year, the Clarinet Quintet, 'La Donna' is richly expressive (some of the lyrical writing has an autumnal quality recalling Brahms's great Clarinet Quintet) and bristling with incident, music that is always about something and going somewhere. It completes an impressive recital of striking music in fine performances, recorded in the presence of the composer."